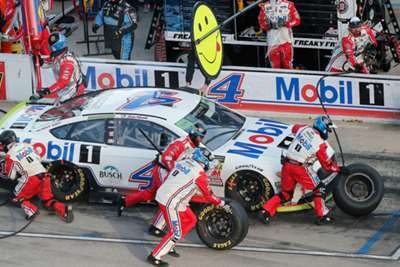 Kevin Harvick had the fastest car all afternoon but had to sweat out overtime to earn the victory at Texas Motor Speedway on Sunday. Harvick led 177 of the 337 laps during the event, and appeared on his way to an easy win after passing leader Ryan Blaney with 17 laps remaining. But a caution for Joey Gase's spin with three laps remaining set up an overtime restart. The win earns Harvick an automatic spot in the Championship 4 playoff finale at Homestead. It is the 2014 NASCAR Cup champion's fourth appearance in the playoff finale in the past five seasons. Harvick now has eight victories in 2018, and 45 in his career. "I'm really, really proud of everyone at Stewart-Haas Racing for these cars we've had for five years now," Harvick said. "We got by him on one restart (with 33 laps to go), but I just couldn't hold him off," Blaney said. "He motored around me."